David Desmond couldn&apos;t believe his eyes when he walked into the Brentwood Chipotle and saw a gleeful sign advertising a 300 calorie chorizo burrito. It was too good to be true. 300 calories? In a burrito? And it came with white rice, black beans, fresh tomato salsa and a sprinkle of cheese? Surely, something must have been wrong. Eager to experiment with Chipotle&apos;s apparently new low-calorie option, Desmond purchased the advertised burrito. While eating it however, he realized something was wrong. From a complaint, filed this week in the Los Angeles County Superior Court, Desmond claims that he "felt excessively full and realized that the burrito couldn&apos;t have been just 300 calories," after eating the entire thing. Similar circumstances unfolded in the days following Desmond&apos;s unfortunate overeating incident. When Edward Gurevich purchased an uncannily similar burrito at a Chipotle location in Burbank, he too was alarmed at the burrito&apos;s apparent size. 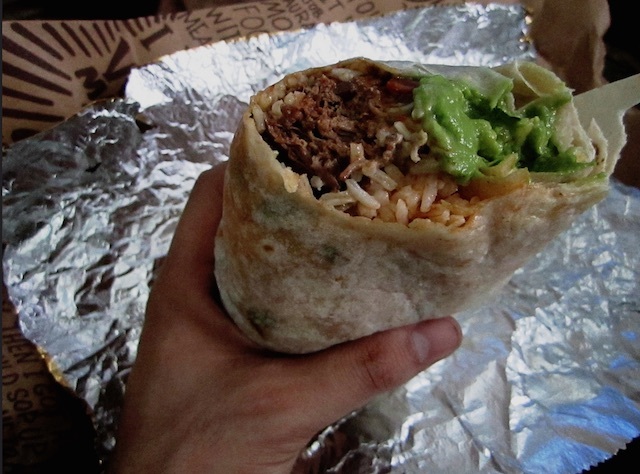 Though he was also under the impression he burrito he purchased contained only 300 calories, the burrito he ultimately consumed likely contained three to four times that value. The same thing happened to Young Hoon Kim, who also claims he felt bloated after he consumed a purportedly 300 calorie burrito at a Chipotle location inside the Century City Westfield mall. On Tuesday, Desmond, Gurevich and Kim filed a lawsuit against Chipotle that claims the fast-casual dining chain &apos;lulls&apos; its customers into "into a false belief that the items they are eating are healthier than they really are," according to City News Service. They claim that a mislabeled sign is grounds for a class action lawsuit, and are suing the company on behalf of—get this—all people who have eaten at Chipotle in the past four years. As restitution, the three men are seeking unspecified damages and an injunction against Chipotle that prohibits the company from using allegedly misleading information in its advertising and promotional campaigns. Altogether, Desmond, Gurevich and Kim claim that the company&apos;s advertising misleads consumers into believing, somehow, that burritos weighing more than a pound are healthy. The company&apos;s pomp about “food with integrity," its “responsibility raised” meat, and Chipotle&apos;s “healthy eating mantra," all do little to counter the objectively unhealthy effect of a 700 calorie bag of chips. That&apos;s about all the news we&apos;ve got on this one. Trawling through Twitter netted this keen find of the erroneous advertisement. It definetly does say 300 calories, but—and don&apos;t take our word for it—what probably happened is a human being made a mistake. Stay tuned, but please don&apos;t forget that lawsuits like this are why America is great, again. Imagine living in a country where you didn&apos;t have the right to sue a fast-food chain because somebody mislabeled a sign. They exist!